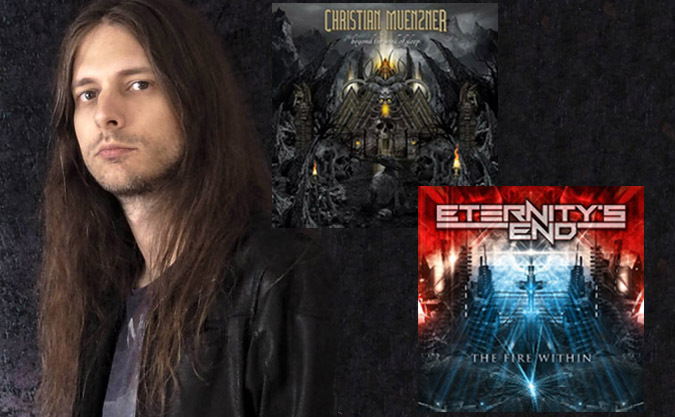 Christian Muenzner, much beloved and respected by peers and fans alike, assumes a modest, gentle presence. Searing and shredding effortlessly through various studio appearances and bands like Obscura, Spawn of Possession, Necrophagist, and latest success, Alkaloid, over the past 15 years has made him a celebrated giant, even among other giants. This has been made especially apparent over very recent weeks when he announced his third solo project, "The Fire Within" with his new-ish solo band, Eternity's End. With Alkaloid mates, Hannes Grossmann and Linus Klausenitzer, as well as Ian Parry and Jimmy Pitts, Muenzner started a crowdsourcing campaign on Indiegogo to recoup the heavy independent costs. Within 10 days, the goal has reached nearly 60 percent, with most of the backers vying for a signed copy of the CD and the tablature book of his previous project, "Beyond the Wall of Sleep."